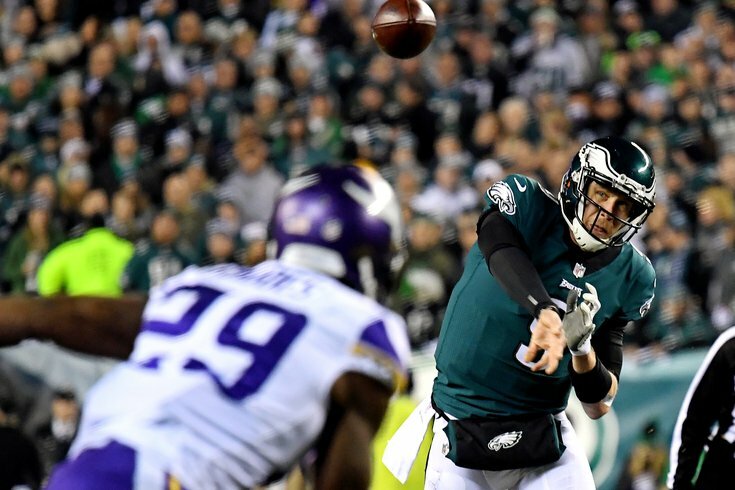 Nick Foles to the Vikings for a 1 and a 4. You know you want to, Spielman. Question from David K.: Peter King said that the Eagles would turn down two first-round picks if that's what they were offered for Nick Foles. Is that actually on the table? King said that he would turn down two first-round picks for Foles. It wasn't a report that that's what the Eagles would do. No, it's not actually on the table. There isn't a snowball's chance in hell that anyone is offering two first-round picks for Nick Foles, incredible as his playoff run was. Even more unlikely would be that the Eagles would turn such an offer down for a player under contract for just one more year that you hope never has to play. Anyway, I believe that fair compensation would something close to a late first-round pick. It wouldn't necessarily have to be a one, but the sum of its parts would have to be the equivalent of at least a late one. That would be my floor if I were Howie Roseman, who has the luxury of sitting back and waiting for a great offer, or, you know, simply keeping Foles, who is also valuable to the Eagles. Question from raoool: Did the Eagles give Foles a veto if someone makes Howie an enticing offer? The one thing the Eagles will have to be mindful of is that Foles brought Philadelphia their first championship since 1960. If Foles doesn't have starter aspirations and wants to stay, they pretty much have to keep him, to a certain point. Otherwise, they're potentially looking at disturbing the overwhelming unity the team has achieved, and to a lesser degree, the fallout of fans angry by the move. That said, if someone were to make an insane offer like the two first-round picks noted above, I'm sorry, but if I'm Howie, I'm not asking anyone for a veto. Question from Kelce's Mummer Strut: Are we sure that Wentz is THAT much better than Foles? Look at Foles' numbers with the Eagles, compared with Wentz's. Foles' are better. Before I begin this answer, I'd like to point out that I don't mean to disparage Foles at all. Foles vs. Wentz has kind of taken on an unnecessary debate, but here we are. That said, Wentz is a much better, more talented player than Foles. It's not even close. If you were to go attribute by attribute at the quarterback position, I would give the edge to Wentz in almost every category, and there would be a rather substantial edge in some cases. I mean, the guy was the best player in the NFL this past season before he tore his ACL. And sure, Foles' numbers with the Eagles, due to that weird-but-amazing 2013 season, stand up to a lot of great quarterbacks, that is if you just completely ignore the seasons where his numbers weren't good. As far as Foles' Eagles numbers vs. Wentz, it's also fair to point out that Foles was operating in an offense with LeSean McCoy and DeSean Jackson in their primes, while Wentz was throwing to guys like Dorial Green-Beckham, Bryce Treggs, and Paul Turner his rookie season. Question from Westpaceagle: Better positional group: OL (with Peters' return) or DL? Here we go comparing again, ha. I'll take the OL. Lane Johnson was the best tackle in football last year, in my view. Certainly, he's by far the best RT in the league. Meanwhile, Jason Kelce re-cemented himself as a top-tier center (if not the best in the NFL), Brandon Brooks was a deserving Pro Bowl selection, Wisniewski was a quality starter, and if Peters is anything close to what he was pre-injury, he's still going to be better than 80 percent of the left tackles in the league. And not only that, their depth is very good, with Big V, Isaac Seumalo, and Chance Warmack. It's clearly the best offensive line in football. The defensive line is great too, but that offensive line is just really hard to beat. Question from Jane: Would a first-round RB be out of the question? Nope, a RB would not be out of the question at all. The Eagles are in a really good spot heading into this offseason, in that they have no glaring needs whatsoever. This time last year, the Eagles' cornerbacks were Leodis McKelvin, Nolan Carroll, Jalen Mills, Ron Brooks, C.J. Smith, and Dwayne Gratz. Their receivers were Dorial Green-Beckham, Jordan Matthews, Nelson Agholor, Bryce Treggs, and Paul Turner. Those positions clearly needed to be heavily addressed. There's nothing remotely close to that awfulness this year. TE: We have a top 5 guy but we need a blocker! OT: I know we found gold in the 5th round but I want more gold. WR: Look, we have the #1, the slot, and a great receiving TE, but we need another guy! LB: Everything could go wrong so we need to cover our bases here. DT: The best starting DT duo in the league is not enough for me. Period. Lol. I would not sign off on agreeing with everything there, but his point was well made that even the Eagles' biggest need areas could be strengths on other teams. I did not list RB as one of their top five needs. So what? If the Eagles are on the clock in the first round and the player who can best help the team happens to be a running back, then yeah, go ahead and take him. Comment from Pragmatic: We won a Super Bowl in midnight green. Maybe we should stick with it. Oh my God! There it is! The first uniform color question/comment ever from an Eagles fan that did not advocate for kelly green. And all it took was a Super Bowl win!